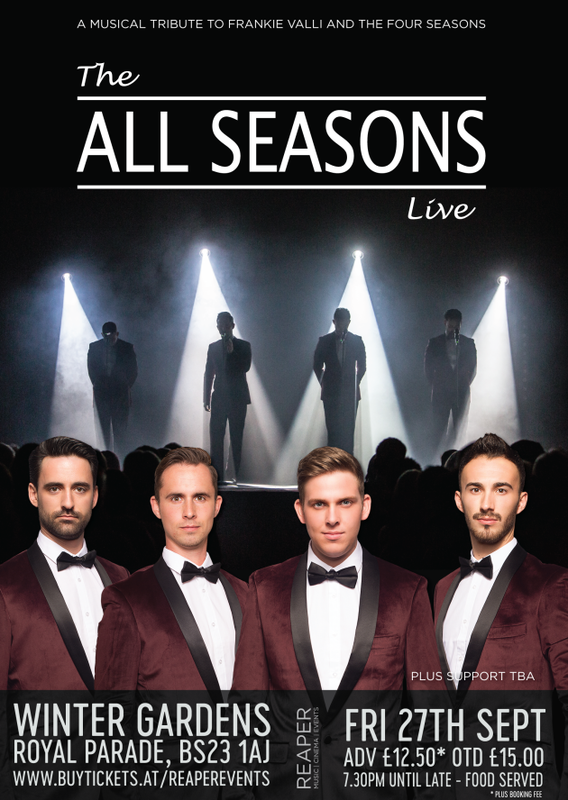 A Musical Tribute To Frankie Valli & The Four Seasons plus support. Including hits like Sherry, Big Girls Don't Cry, Let's Hang On, Working My Way Back To You and many more you'll be transported on a journey through all their hits from the 60's and 70's. This will be a seated gig with VIP Reserved Ballroom tables available for 4, 8 and VIP Balcony tables for 7. There will also be unreserved tables available for those coming to the show in smaller numbers, but will be available on a first come, first served basis. Once these tables are full there will be unreserved seating towards the rear of the ballroom (all with a great view!). Limited Early Bird tickets are available for just £9.50 (unreserved Seated ticket Table and Ballroom Rear only) with our normal advance price of £11.50 once we have sold all our Early Bird Tickets. Tickets will be available on the door for £15.00. If you wish to have your own table you will need to purchase a VIP table package. This will be reserved for you the entire evening. These tables are for a maximum of 7 people (booked under one ticket) and will give you a reserved table for the entire evening with a great view from the balcony. You'll benefit from table service should you wish to make use of it during the performances only, with your waiters able to take both cash and card for your drinks orders. These tables are for a maximum of 4 people (booked under one ticket) and will give you a reserved table for the entire evening with a great view from the ballroom. You'll benefit from table service should you wish to make use of it during the performances only, with your waiters able to take both cash and card for your drinks orders. These tables are for a maximum of 8 people (booked under one ticket) and will give you a reserved table for the entire evening with a great view from the ballroom. You'll benefit from table service should you wish to make use of it during the performances only, with your waiters able to take both cash and card for your drinks orders.